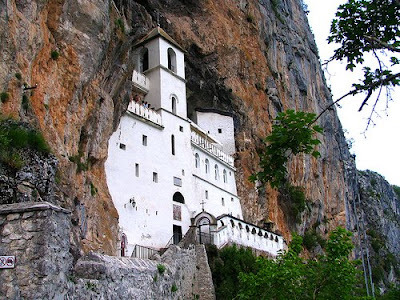 Among the Serbian and Montenegrin people there are an innumerable amount of stories of miracles performed through the holy relics of Saint Basil of Ostrog. One of the most interesting stories is that of the United States Senator William (Bill) Barr. His wife was Dr. Dojna Galic Barr, a prominent American psychiatrist with a Montenegrin heritage, who published a book named Blue Pigeon where she documented the visit of her husband to the Monastery of Saint Basil. The Republican Senator from Illinois survived an assassination attack in 1970. Five sticks of dynamite were placed beneath his green Cadillac limousine and exploded when the driver turned the key to start the ignition. This occurred on June 2, 1970 and when it happened all news and radio stations were briefly cut off to broadcast the news of this assassination attempt. The Police Department immediately began an investigation and it was for a long time held up on file, but it was never discovered who was behind this heinous act and eventually investigations ceased. Police suspected that it involved someone who was bothered by this admired politician, who had led a group of five fellow senators in the investigation to allow blacks to live in an urban complex along with whites, which bothered many racist individuals. Senator Barr was wounded and the doctors were not able to save his right leg. The remaining pain created much difficulty for him and the doctors were unable to help with the pain of the amputated leg or the constant fever and other related medical issues, such as the constant burning through his muscles. Doctors tried all possible methods to control the pain: hypnosis, acupuncture, drugs such as morphine and several operations. Nothing worked. According to the Senator, one night he had an unusual dream in which he visited a small white church on the cliff of a mountain. The dream kept reappearing night after night, and an old man with white hair and beard and speaking in a language he did not understand walked him from room to room of this church while at the same time healing ill people in the church with his touch. He told his wife about the dream, but neither he nor she understood it. While he was looking for medicine that could help him with his pains, the Senator was informed by a doctor of a maker of modern prosthetics whose heritage was from Yugoslavia and lived in Lansing, Michigan. Unfortunately he had died but was succeeded by his son named Jane. During a visit to the man's office he noticed a picture of a small white church and an icon of a white haired Saint Basil of Ostrog on the reception wall. He eventually received the prosthesis and was able to walk almost normal, but was still in severe pain. Senator Bill decided to visit Jane again to find out more about Saint Basil, since he was haunted by this saintly figure. From Jane he found out everything about Ostrog and decided to visit the Monastery. Jane agreed to go with him with a group of prosthetic patients. He made this trip in 1980 together with the group of other patience who lost limbs. In the days before the trip the Senator fasted in a strict Orthodox manner for forty days and learned the "Our Father" in the Serbian language with the help of his Orthodox wife, and he read about Saint Basil and his miracles. During his stay in Montenegro he walked up to the Upper Monastery daily with much pain because he was strangely attracted to the place. It should be noted that this walk lasts about an hour and is uphill. He stated that these visits could not compare to anything else in life and he neither cared how difficult it was nor how long. 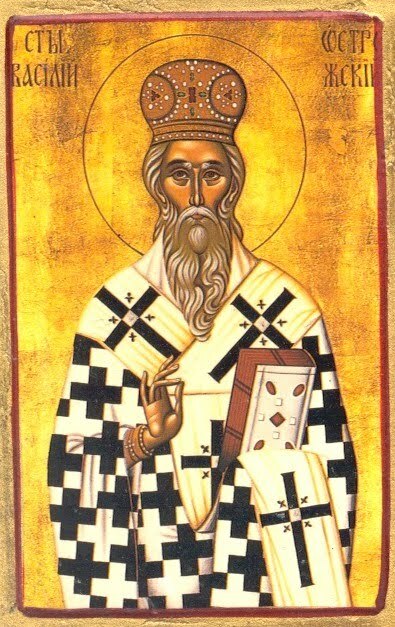 Every day the pains became less and less, especially as he knelt in front of the relics of Saint Basil. Later he said: "I admit, I was a skeptic...I thought it may be just a superstition. But this is a phenomenon that is impossible outside the Church. I saw blind, deaf, dumb patients carried on stretchers, children and adults, all climb uphill to the Monastery either on foot or in a car. I believe in God's miracles, for I am a witness." While in Ostrog, Senator Bill Barr was moved towards Orthodoxy through Saint Basil. He vowed to devote his life to helping people with amputated body parts all over the world, and spread the knowledge of the benefits of the new discoveries in modern prosthetics. He returned home from his trip with no pain at all and with great faith in his heart and soul, and three icons - one for his wife, one for the house, and one that he kept always on his key chain. As he had promised at the shrine of St. Basil, Bill Barr founded an Institute in which the best doctors and nurses in prosthetics worked. He also organized mobile clinics throughout America, Africa and the Middle East. He especially helped youth that were victims of terrorist attacks. In his humanitarian campaigns he would often fly as the pilot. From one mission however he was not to return home. One day Dojna was informed by telephone from Washington that a helicopter carrying a clinic crashed and burst into flames. Among the victims were Senator Bill and Jane. Only portions of their body parts were recovered. Among the recovered items given to Dojna was the key chain with the icon of Saint Basil. For more about Saint Basil and his Monastery, see here.